In addition to working about 80 hours a week as a surgical resident at the University of California, Los Angeles, Medical Center, Daniel Riskin is building companies to develop and market new medical devices. "Physicians have an obligation to innovate," says Riskin. While training to be a doctor at Boston University and Tufts University, Riskin dabbled in technology development, writing software to help physicians manage their practices and researching different designs for surgical clips with a medical-device company. But he wanted to do more -- to come up with his own inventions and bring them into widespread use. Thus he enrolled, partway through his residency, at MITs Sloan School of Management. While studying for his MBA, he kept up his operating-room skills by working at private surgical practices on evenings and weekends. 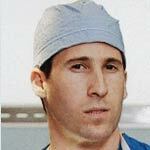 After graduating from Sloan, Riskin was named the first fellow in Stanford Universitys new surgical-innovation program. At Stanford, he and his collaborators developed an elastic, adhesive, polymer-based patch that they hope will provide a less painful alternative to staples or stitches as a way to close up wounds and surgical incisions. He is now forming a company to commercialize the patch, which he expects will also reduce scarring. Riskin also helps doctors with few business skills or little experience to become innovators themselves. Last year, Riskin, along with Michael Laposata, director of clinical laboratories at Massachusetts General Hospital in Boston, started a company, MedPacks, to develop portable diagnostic tests and medications that patients could use at home -- before getting to the emergency room -- if they thought they were having heart attacks. Such early treatment could lower the risk of death or complications by as much as 50 percent. "If were going to do anything innovative," says Laposata, "were going to need more Dans."